Chocolate cake or brownies layered with no-bake blackberry cheesecake and homemade chocolate pudding — a rich, chocolatey, fruity dessert that’s perfect any time of the year! Make from scratch or use optional shortcuts to keep things quick and easy! This is another one of my recipe redo’s, and can I just say I was SO happy to update this one? When I started following the recipe (yes, my own recipe!) 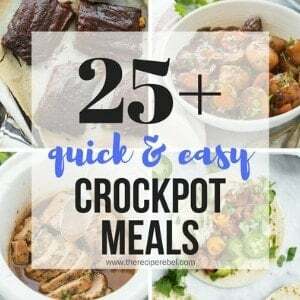 I was thinking, “this is way more complicated than it needs to be!” I changed the ingredients and the method quite a bit this time, but only to make it so much simpler and easier to follow! 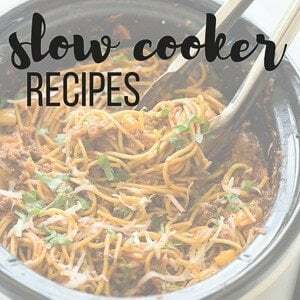 The flavors were great, though, and I wanted to streamline things a little when I redid it and, taking out unnecessary ingredients and steps that were making things complicated. There are several ways that you can go the extra mile and do everything from scratch, or take some shortcuts to make things even easier. I will include those options just above the recipe! I used some leftover brownies that I had in the freezer as my “cake”‘ — the BEST brownies ever, might I add. You can use chocolate cake instead, but for me, fudgier is always better! The pudding is a little softer than one you would make if you were making pudding just to eat, but I love the way it sneaks into all of the cracks in your brownie cubes! Here are some different options shortcuts you can use if you’re short on time or you just want to avoid the oven! You could use prepared chocolate pudding off of the shelf. You can make the homemade chocolate pudding in the recipe. You can make a brownie mix. You can make your favorite cake recipe or chocolate cake mix. Or you can make things super simple and buy some two-bite brownies from the store and chop them up! There’s really no way to cheat on the cheesecake, unless you were to stir in some seedless blackberry jam instead of pureeing and straining the berries. Whip your own cream and sweeten with sugar. 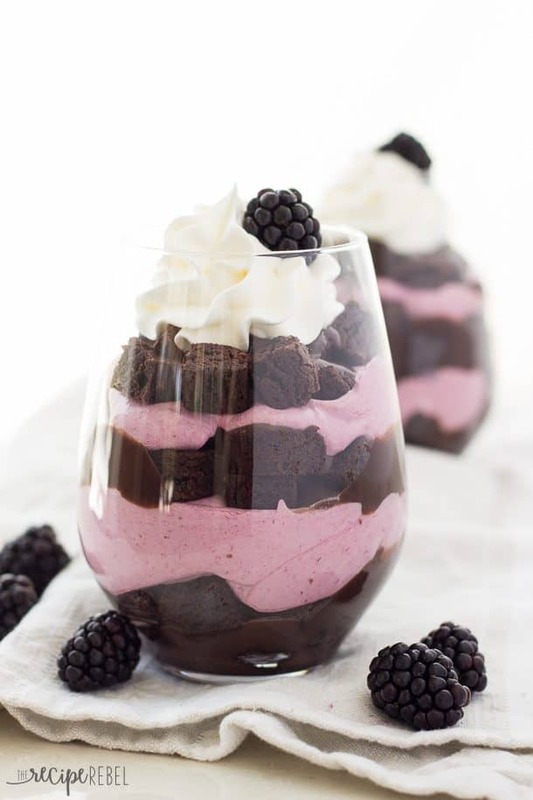 Chocolate cake, homemade chocolate pudding and a blackberry cheesecake mousse create a rich and fruity trifle. For the mousse: In a stand mixer or large bowl with electric mixer, beat cream cheese until smooth. Add sugar and beat until combined. Puree blackberries and press through a fine mesh strainer into the cream cheese. Beat until combined. Fold in whipped cream, carefully turning the mixture over with a spatula until combined. For the pudding: Combine sugar, cocoa, corn starch and salt in a large pot. Slowly whisk in milk. Cook over medium heat stirring often. As mixture begins to thicken, whisk constantly. Assembly: Cut brownie cake into cubes. Layer first cake, then pudding, then mousse, creating as many layers as you desire. Top with whipped cream and fresh blackberries if desired. In a stand mixer or large bowl with electric mixer, beat cream cheese until smooth. Add sugar and beat until combined. Combine sugar, cocoa, corn starch and salt in a large pot. Slowly whisk in milk. Cook over medium heat stirring often. As mixture begins to thicken, whisk constantly. Cut brownie cake into cubes. Layer first cake, then pudding, then mousse, creating as many layers as you desire. Top with whipped cream and fresh blackberries if desired. Homemade Pudding recipe from Whipperberry. 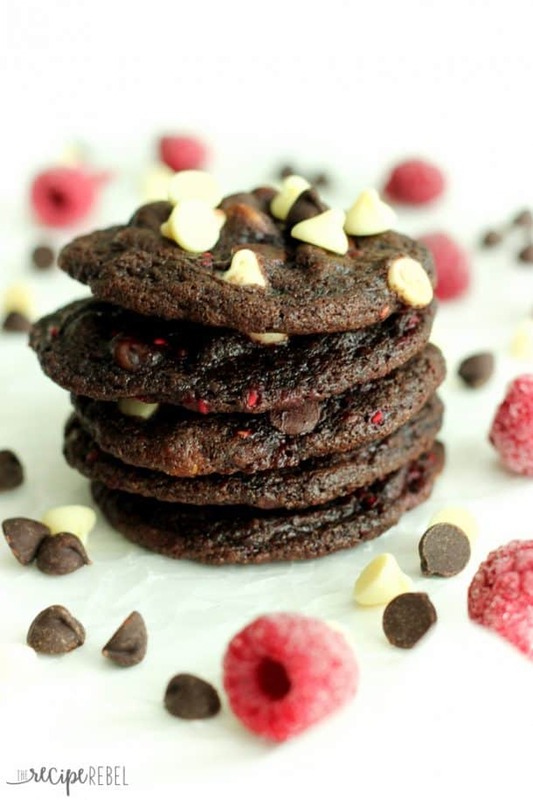 Or these Triple Chocolate Raspberry Cookies! 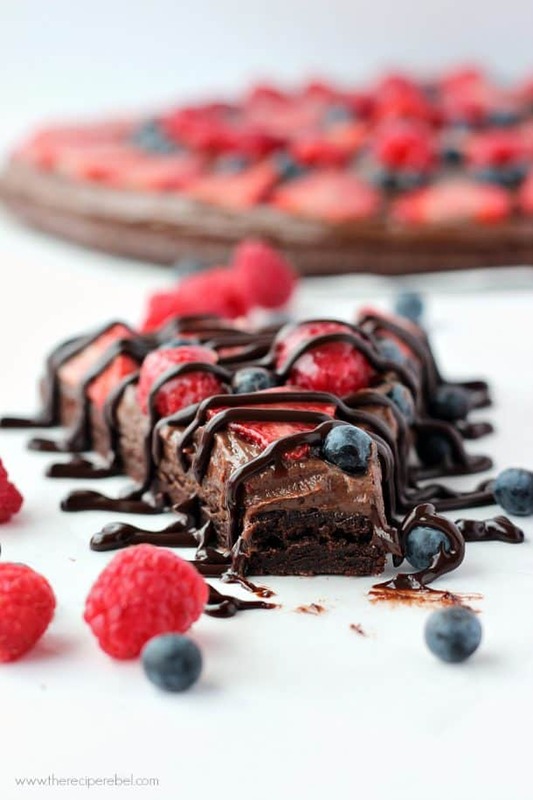 Chocolate Berry Tart from Bakerita. Mixed Berry Crisp With Chocolate and Pecans from She Likes Food. Is it 1 1/2 cup pureed blackberries or just normal berries? Look at all these layers of deliciousness! Mmm, you have my sweet tooth craving these! Chocolate and berries are my jam! So elegent too! 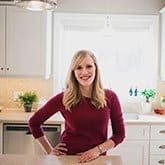 I feel like I’ve done the same thing, read over past recipes and wondered what the heck I was thinking when I wrote them up! Maybe I should go back and re-so some of mine! Brownies are the best and combining them with blackberries and cheesecake sounds even better!! Beautiful photos! These look downright sinful. Brownies, cheesecake, and blackberries is a winning combo in my books! Wow! What a gorgeous dessert! Amazing Ashley! This dessert looks refreshing & decadent! I cannot wait to indulge. Pinned this for later, YUM! I SOOOO need to update some old recipes!!!! such a great idea!!! 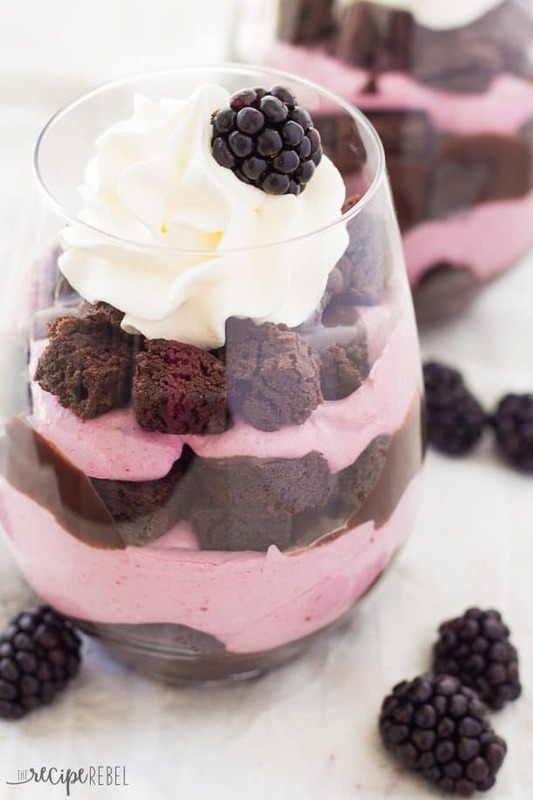 and LOVE these chocolate-blackberry-cheesecake-trifles!!!!! perfection! It totally used to make things way more complicated than I needed to! 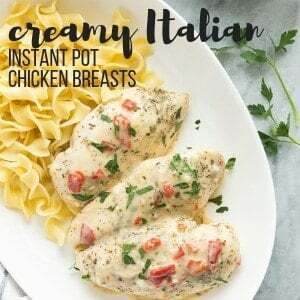 Love how simple this recipe is! And gorgeous photos Ashley! I will take 10 of these! I have never thought to make a brownie based trifle before so thanks for the idea. This is DELICIOUS. Those trifles look fantastic Ashley! Love the colour of that blackberry cheesecake, it’s so pretty! These look so good! I love anything made with blackberries in the summer! These are some ridiculously delicious looking trifles!! 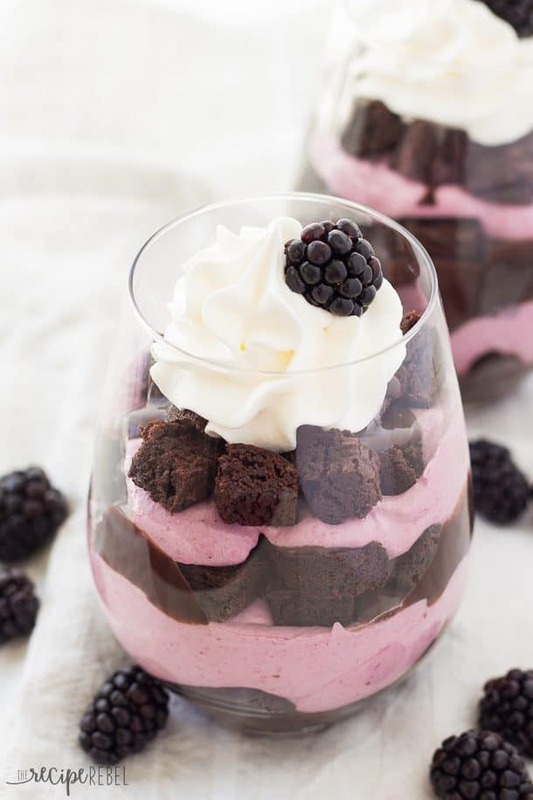 I love anything with blackberries and the chocolate and cheesecake combo…I’m just drooling. Pinned! These trifles right here are amazing! I can almost taste them! These look lovely! And yes, I need to go back and remake some of my first posts for sure. It’s so fun to personal photography growth! These trifles look so GORGEOUS! The cheesecake mousse is such a pretty pink and I love the blackberry and chocolate combo! Delicious! I’ll take brownies over cake any day! Can I have this for breakfast? Looks so pretty and delicious! Glad you redid it so we can all see and try it again! Pinned! 🙂 Happy Weekend!! I think I need this for breakfast! This is absolutely stunning, Ashley! I’m so glad that you redid this recipe because it looks SO amazing! Pinned!